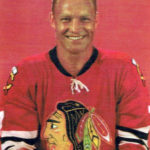 Bobby Hull is a Canadian former ice hockey player who is regarded as one of the greatest players of all time. His blonde hair, end to end rushes, incredible skating speed, and ability to shoot the puck at very high velocity all earned him the nickname “The Golden Jet”. His talents were such that often one or two opposing players were assigned just to shadow him—a tribute to his explosiveness. In his 23 years in the National Hockey League (NHL) and World Hockey Association (WHA), Hull played for the Chicago Black Hawks, Winnipeg Jets, and Hartford Whalers. "Somewhere in my wildest childhood I must have done something right. Being able to make a boyhood dream come true is one thing, but to have a kid come along and thrill his dad like Brett Hull has thrilled me over his career is too much for one guy to handle."